Yea finally, the Engineer called Form from the Void, according to its Design, and saw that it was nominal. With the printer fuser repaired, I was able to get a good overlay print onto Papilio white self-adhesive polyester. Setting the print type to 'labels' produced the best result by far. Then I cold-laminated a protective textured vinyl overlay onto that. It took a few attempts to find a technique that proces a good lamination with no bubbles, but here we are! What good is a tool if you don't know what it can and cannot do? ...and that is how I lost a round of fuser roulette with my laser printer. 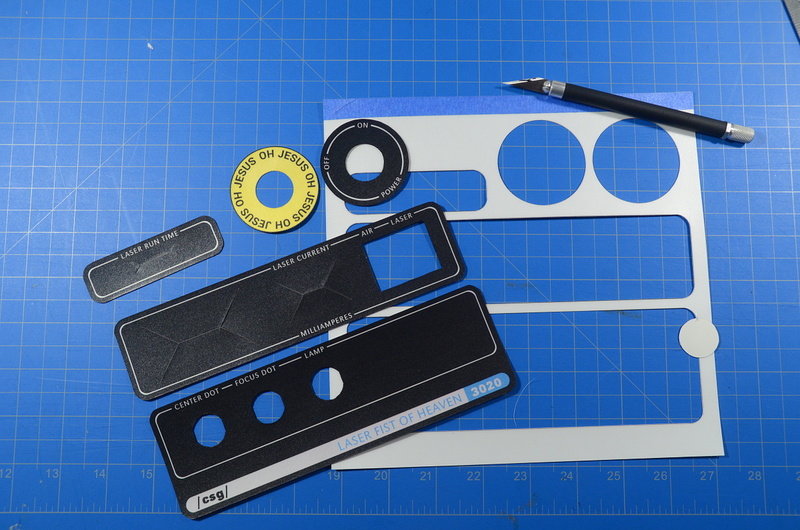 I was running self-adhesive polyester through the printer in some test runs for the control panel overlays, and a sheet separated from the liner in the feed, the adhesive on the folded-over corner caught the fuser, and, well, that was that. 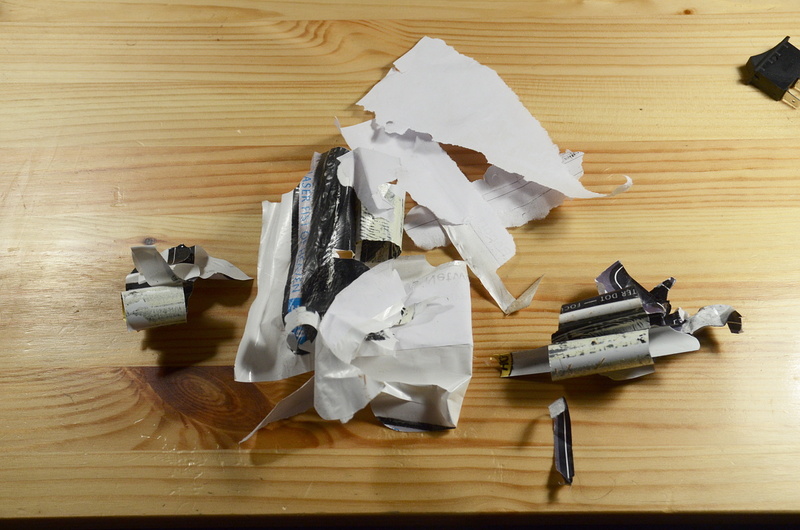 "Paper jam in tray 2"
The good and rather unexpected news: Despite other failings, HP is still publishing highly-complete tear-down and service manuals for its consumer printers, and my M277dw was no exception. 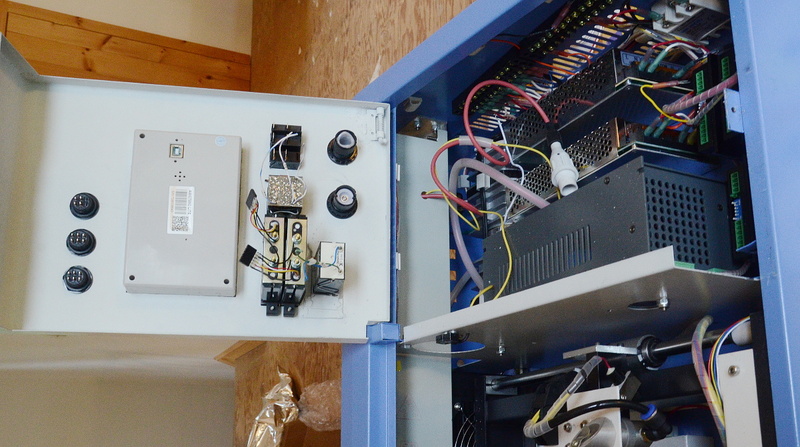 The fuser is not a user-replaceable part, and the printer is not designed to be easy to disassemble. It took me almost an hour of work to finally extract the fuser unit. But everything came apart according to the manual, and although the fuser wasn't intended to be disassembled either, it too broke down without fuss. Another half hour of slowly peeling sticky, melted polyester off the roller later, I had it clean. And, miraculously, after getting everything back together-- the printer still worked perfectly. No damage. Whew. In any case, lesson learned: From now on I run my adhesive media with a masking tape leader folded over the front edge. Most makers I know keep a bunch of paint colors around. Me, I have a few primaries and maybe 40 different whites. Nothing messes with me like THE WRONG WHITE. And yes, I *do* own a handheld spectrophotometer! Why do you ask? 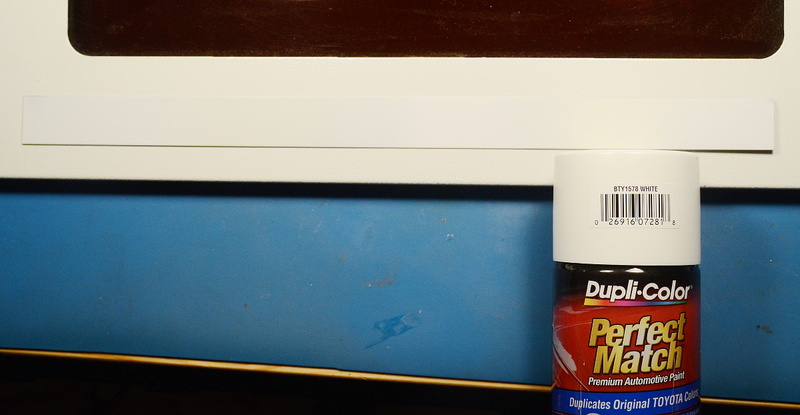 I need to paint my new control panel with a good match to the other panels, so I got out my paint test strips. It's hard to tell, but there are five different white stripes on the particular pictured strip. Anyway, we have a winner! Spectrophotometer agrees! 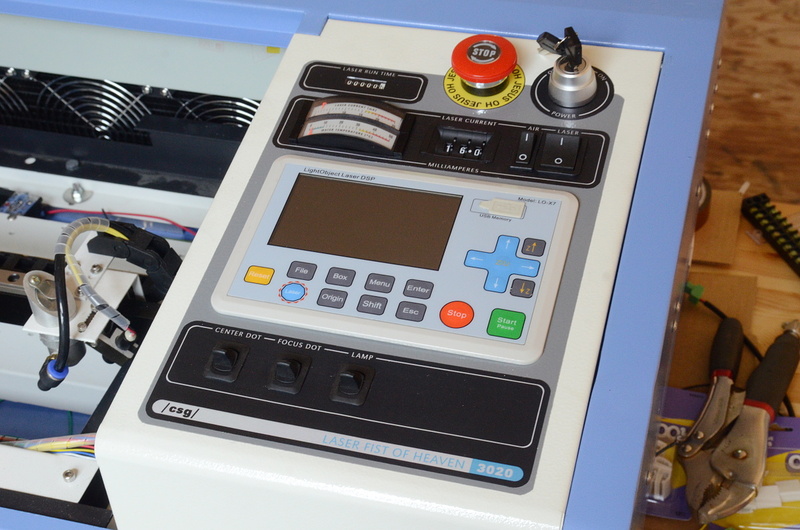 The laser cutter's white matches Duplicolor 'Toyota White'. 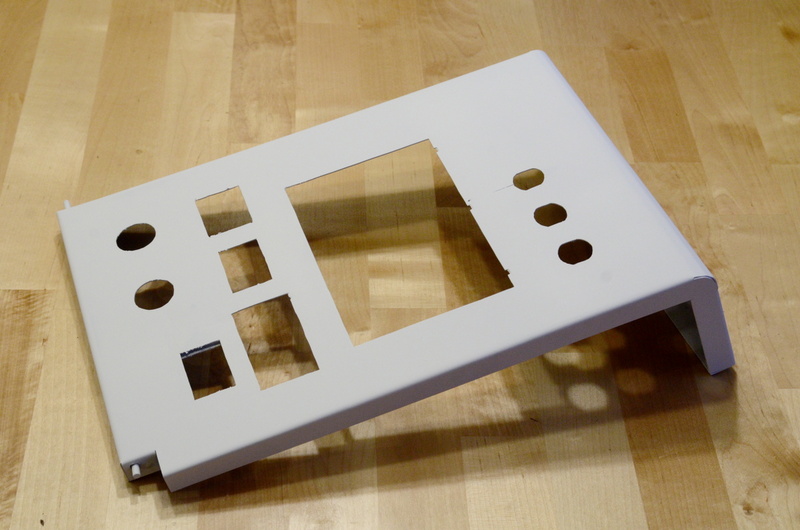 Switch and indicator cutouts, final welds, and a nice layer of light-grey primer: DONE. The cutouts were done on Fox's nice DeWalt scroll saw. Strong enough for a metal, even if it's made for a wood. I didn't bother with super-precise cuts, nor was I particularly careful with the grinder. There's a number of imperfections that aren't obvious in the picture (though the wiggly cuts kinda are). But that's OK: it all gets covered by the printed control overlay, so none of that will show. Next step is real painting. Humidity is near 100% right now though, so I probably won't be able to do that until tomorrow. I'll guess I'm not the first person to make that joke.